As a young sailor, literally wet behind the ears, my first lesson came the hard way: Learn your boat’s language. This happened one fateful day when my skipper said “Here we go!” and turned over the helm, leaving me pinned behind the jib. My naïve mind thought skippers always asked “Ready about?” first. That one missed cue meant the difference between taking the win and taking a swim. A better communication plan begins with the words that aren’t said. This is what I call your team’s body language. Meaning, everyone knows what to do without having to talk about it. The best sailing crews know the exact moves they take through the boat during maneuvers, and rarely vary. Who moves first during a tack. Who sits where during a set. Where your feet are positioned at all times. I even sailed on a team where particular tasks were assigned during pre-race rigging. We took all movements seriously and it reduced the amount of errors made. When everyone knows their job and position in the boat during all maneuvers there’s no need to have conversation. I once heard it called “economy of movement,” meaning there is no wasted motion or chatter in the boat. I once had a crew who could recite each and every exact move he made during every maneuver, down to his arm positions. It was impressive, if not wonderfully boring. The best teams have an arsenal of disaster recovery plans. Before they happen. I’ll never forget the time I joined a J-24 team for a regatta and came out of a tack with everybody yelling “A**hole!” Once I got over the hurt feelings, I learned it wasn’t an insult aimed at me but rather a term referring to a knot or snag in the windward jib sheet. When shouted, it was an instruction for everyone to check the sheet in his or her immediate area. 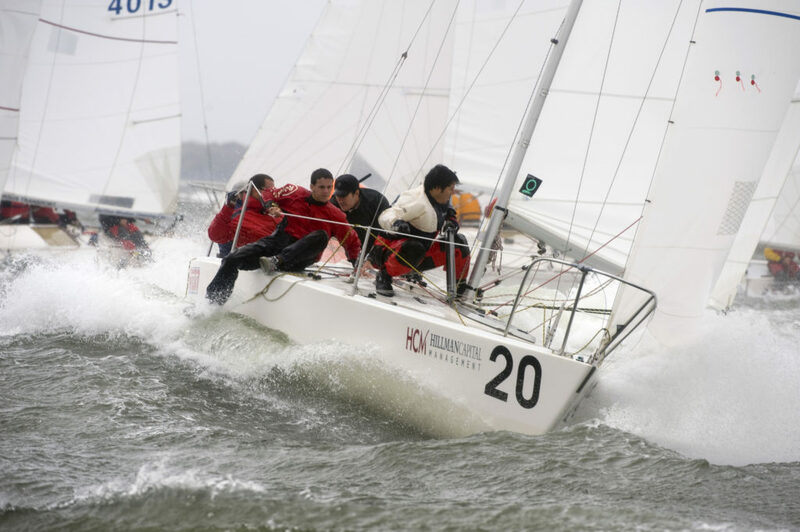 It’s important to have a set series of steps and phrases that alert your team to solve your common emergencies such as sheet snags, figure-8s during spinnaker sets, and knockdowns. I frequently race on bilge-boarded scows, and when a board doesn’t fully drop during a tack it’s standard practice to yell “Gimme 1-2-3,” which means on the count of 3 the skipper jerks the helm so that the leeward board can be fully extended. That is the type of jargon every team must employ to improve their disaster recovery. How do you develop this? Hold a regular post-race debrief session. It’s a great way to improve your emergency recovery plans because it offers a calmer setting for your team to discuss what happened on the racecourse. The final rule of communication on your boat is to cut down the chatter. You don’t need people speculating, complaining, or spectating during your race. The fewer words on a boat the better the team focus. You can achieve this by creating a set of consistent commands for your team. For example, saying “Breeze soft in 5” doesn’t just mean you’re heading into a lull, it is also a signal for the crew to: 1) ease off controls, 2) lighten sail trim, and 3) move weight to leeward. Commands like this should be discussed and routinely practiced. The skipper and crew each know exactly what the other is asking and telling. Efficient, consistent communication is vital. There is no one universal language – I’ve found it varies from boat-to-boat – the key is to have your team speaking the same language, with minimal chatter. Better team rapport can play a vital part in your boat’s improvement in the fleet standings. If you haven’t considered it before, make a point of using the three steps above to improve your skipper and crew communication. These are some of my tried-and-true hints… please share yours in the comments.